Twelve-year-old Tahirih Osborne describes her relationship with her grandmother as a "quasi-friend. "- "I have more of a connection with her than anyone else," she said. "I can't even talk to my friends about some of the stuff we talk about." One reason Tahirih may feel such closeness is because she lives with her grandmother, Jacquie Osborne. While this living arrangement is not conventional, it is becoming more common. Jacquie is one of 20,287 grandparents in Lauderdale County who are raising their grandchildren. In Colbert County, there are 13,077 grandparents raising grandchildren. 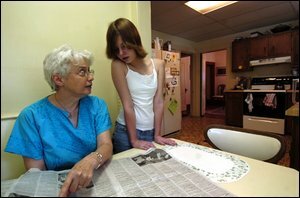 In Alabama, there are 92,648 children living in grandparent-headed households, according to AARP. This is approximately 8.2 percent of children in the state. "There isn't a lot of support out there, but there is more than there used to be," Jacquie Osborne said. Jacquie attends a grandparents circle at the Cooperative Extension Center in Florence, where she shares experiences and advice with other grandparents. "It's nice to talk about things openly, and it's relaxing to know if you have a problem, there are people with the same situation," said Shirley Suttle, another grandparent in the circle. Mary Andrews, regional extension agent with urban affairs and new nontraditional programs, leads the group. "The circle meets once a month for grandparents to come together and talk about issues facing them," Andrews said. The program offers different workshops dealing with child development, parenting for a second time and adjusting to change. About 80 grandparents are enrolled in the group. Colbert and Lauderdale family courts and the city and county school systems help with the circle. Alabama CARES, a support group for Alabama caregivers, gave $2,500 last year to aid with school supplies. "Rebuilding the family is one of the bigger issues," Andrews said. "They have to rebuild their own family as a result of taking on their grandchildren." This was certainly the case for Jacquie and her granddaughter. After Tahirih's parents divorced, Tahirih and her father moved in with her grandparents. Because her father is a writer and his job schedule is unpredictable, Tahirih's grandmother steps in as a parent. "I'm 62, and I am continuing to work," Jacquie said. "I might have decided to retire, which is the normal age for retiring, especially for women." Suttle is in the same position. While she said she might still be working, she wouldn't be working as much. Suttle's 16-year-old granddaughter, Brittnie Granville, lives with her in Florence. "Without income, when I can't afford for me, I provide for her," Suttle said. "I just cut back on mine." Time is another sacrifice that is made by grandparents. "You develop friendships and different social activities when your kids are grown, then you have to sacrifice them," Jacquie said. Both Jacquie and Suttle are optimistic and happy about their situations. "Love and patience makes hard times easier," Suttle said. "Love heals everything." With a new generation of cell phones and MySpace, grandparents raising grandchildren may find themselves a bit out of touch. Tahirih often finds herself keeping her grandmother up-to-date on technology. "She's pretty net-savvy, but sometimes I think she's happy with just not knowing how to do some stuff," Tahirih said. "I clear her cookies (from her computer) when she's not looking." Granville finds herself doing the same for her grandmother, too. "I have to program her cell phone sometimes," she said. Jacquie attributes this to the new generation being more able to multitask. Suttle said it's hard to tell her granddaughter something she doesn't already know. "My children used to sit and listen, but with Brittnie, she knows it already," Suttle said. Other things the grandparents find themselves adjusting to is the amount of "stuff" this generation has. "If my child had only one pair of shoes, they were fine with that," Suttle said. "This generation isn't. If they don't have it, they are kicked aside." After searching all over town for a certain pair of shoes for Tahirih, Jacquie went home, only to find the shoes on the Internet. "They just have more places to look for stuff," Jacquie said. Of course, the grandchildren who reap the benefits won't complain. "I know I get more stuff from my grandmother," Granville said. "I'm spoiled." While some things may come easier after the first try, this isn't always the case with parents. "It's hard to explain to someone who hasn't been a parent before, or even to someone who has," Jacquie said. "It's a tremendous emotional responsibility." Jacquie said that when you are young, time passes slower, but as you grow older, time speeds up. Because of this, she sees her grandchild grow faster than her children did. With Suttle, there never was an option whether her granddaughter would live with her. "Brittnie was born out of wedlock and her and her dad lived with me. When it was time for him to move out, it wasn't time for her to go," Suttle said. When Brittnie's father died in 1997, her grandmother continued to care for her. "I just fell in love with Brittnie before she was even born," Suttle said. Suttle doesn't have full custody of her granddaughter, but she has responsibility to sign for medical bills and school permission slips. The same situation applies with Jacquie and her granddaughter, whose father still has full custody. As for Granville and Tahirih, there is no embarrassment that comes with living with their grandparents. "When people ask, I just tell them," Tahirih said. "I'm happy with my grandma. There's no where else to go." You may use this URL in other web pages so that people can see this story without needing to login.